'The Turning'. It's a big thing, apparently. Started in Reading. The founder Yinka Oyekan received a vision from the Lord telling him that unless he managed to get all the churches in his locality working together on a mission, there would be no blessing. But if he managed to unite them, the Lord would surely bless. That's all the churches, mind, whether Roman Catholic, middle of the road Church of England, Liberal Methodist, Baptist and not forgetting Evangelical fellowships. People who expressed an interest in the Christian faith as a result of the mission would then be directed towards church that aligned with their preferences. Quite how churches who don't agree on the evangel are meant to do evangelism together isn't explained. Neither is how a church can be a church in any meaningful sense if the gospel isn't preached among them. Ecumenical pragmatism, it seems, is the order of the day. What we need is a turning back to Scripture to see what constitutes a gospel church. 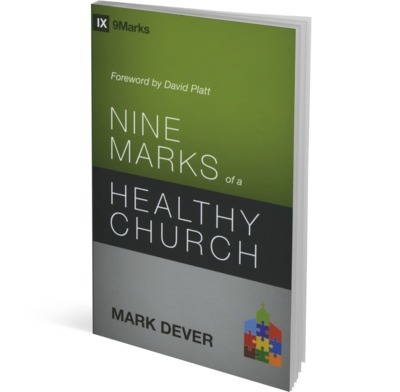 Mark Dever's work will help to point us in the right direction. I'd long heard of the 'Nine Marks' principles, but never quite got round to reading this seminal text. As mentioned in an earlier review, someone who has been coming along to our church asked if I could recommend a simple introduction to Baptist history and beliefs. That was Erroll Hulse's Introducing the Baptists. While rummaging around in the study, trying to find something suitable, I picked up Nine Marks of a Healthy Church by Mark Dever. I think a friend must have given me a copy a little while ago. It wasn't quite what I was looking for when it came to a Baptist intro, hence the Hulse title. But having flicked through Nine Marks, I thought I should give it a proper read. It's a well known work on Baptist Church principles, focusing on the features of a healthy church, not simply on the details of church polity. Many of the 'marks' no doubt feature in non-Baptist churches. Congregationalists would probably agree with much of what's written here. Dever writes from a 'Reformed Baptist' standpoint. But if anything, greater attention could have been devoted to Baptist distinctives on baptism, membership and the relationship between church and state. Now, the Reformed tradition holds that there are two essential marks of a true church: the pure preaching of the Word of God, and the right administration of the Sacraments. Church discipline is sometimes taken as a third mark, although if marks one and two are applied properly, church discipline should also follow. The work is America in its setting, so it takes a little effort to contexualtise its teaching for the UK church scene. But the underlying principles are biblical and therefore applicable to all cultures. Some points seem counterintuitive. Dever argues that making it more difficult to become a church member and being willing to remove people from membership will help ensure healthy growth. How can being picky about who can come in and getting some out lead to growth? Because that's what the Bible teaches and the gospel demands. It is therefore vital that we have a clear understanding of biblical theology, the gospel, conversion, evangelism and church membership. Churches should comprise of what the Puritans used to call 'visible saints'. The church is most effective in reaching the world when she church is distinct from the world. In these individualistic times it is encouraging to read a book that emphasises the importance of church life for evangelism, discipleship and spiritual growth. The basics of biblical church leadership are also spelled out, literally. In relation to local congregations, leaders are the BOSS, B=Boss, O=Out Front, S=Serve, S=Supply. Practical tips and a variety of other bits and pieces are included in the appendices. Dever offers no 'silver bullet' that will guarantee overnight church growth. His is a call to the long term task of forming gospel-centred, biblically faithful churches in which believers may thrive and where non-Christians can encounter the message of salvation. The writer offers the Puritan pastor William Gouge as an example of longevity in ministry. He was minister of the same church from June 1608 until the day of his death, 12 December 1653. The height of the preacher's ambition was 'to go from Blackfriars (his church) to heaven', and so he did after a forty-six year pastorate. No quick fix, but long obedience in the same direction is the order of the day. Read and consider whether the fellowship in which you are involved bears the marks of a healthy church.